EVENT STARTS MON FEB 24 AT 9 AM PT, deals include Up to 80% Off: Designer Shoes, Trafalgar, Alex Cannon, Alexandre Plokhov, Ben Sherman Ties, Scotch & Soda, Tom Ford, LODIS Handbags & Accessories, Nina Ricci Bags & Accessories, Chocolat Blu Shoes, Handbags & More, Knitwear by Cotton Addiction, Rick Owens Dresses & Separates, Vince Camuto Dresses, Argento Vivo Jewelry, Zodiac & Initial Jewelry, 29 Cosmetics at MYHABIT. Elevate your shoe wardrobe with these handsome styles from our favorite designers. Nothing is more timeless and versatile than a sleek loafer. A classic oxford makes your best suit look even better. Or go sporty with a lace-up sneaker. Exotic, luxurious, refined. Trafalgar hits the mark over and beyond with each of its meticulously crafted accessories. Lizard, in shades of navy, black and white, adds texture and character to wallets and card cases of extraordinary quality. Contrast-stitched belts are effortlessly casual. Reversible belts give you flexibility and style. When you wear Trafalgar, you’ll achieve a look that reads sophistication. We’re in the middle of layering season, and that means having plenty of pieces that look great and will keep you warm. Stock up on sweaters, button-up shirts and coats with this collection from New York-based Alex Cannon. In classic shades and versatile prints, you’ll reach for these pieces all season long. Are you a modern professional gentleman, sensible but bold? A punchy diagonal stripe design sounds just right. Perhaps you’re the life of the party: fun, quirky, a risk-taker. Why, you must be a bow tie. No matter your taste, style or situation, we’ve got ties here to match you best. Bring your personality, Ben Sherman will bring the rest. Amsterdam-based Scotch & Soda brings us a little European flavor with this hip collection. From corduroys and chinos to a range of cool jackets, these pieces easily elevate your casual wardrobe. What better way to step out than in Tom Ford style? Found here, a selection of designs from the American designer, known for major star power and celebrity fashion. You can’t go wrong with a classically tailored suit. And if a slightly more casual look is what you’re after, sweaters and smart jackets will keep you polished. Established in 1965 by Loewe of Spain and Dan Segat, LODIS brought Madrid’s most exclusive leather goods house to the States. Creating clean, sophisticated leather goods with a modern edge is their mission. Using traditional craftsmanship and refined materials, the attention to detail is evident in this collection of luxurious handbags, wallets and more. Find your favorite in a palette ranging from neutral to metallic to bright. Chocolat Blu adds the perfect final touch that takes a ho-hum outfit to the next style level. From a tonal patchwork style hobo to comfy cork wedges in metallic and colorblock designs, this modern yet casual line of shoes and handbags really stands out. 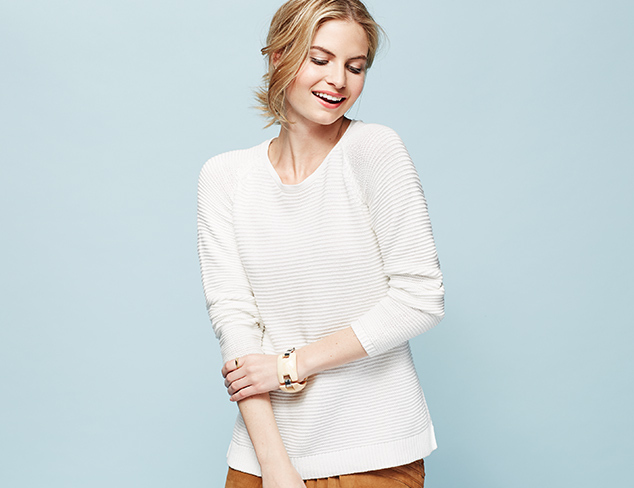 Soft, cozy knits are the perfect casual wardrobe staple. And that’s just what you’ll find in this collection from Cotton Addiction. From open-knit pullover sweaters to cardigans perfect for layering, you’ll look great and feel comfortable, no matter where the day takes you. Since 1994, California-born Rick Owens has been dazzling the fashion world with his avant-garde take on design. He began his career small, selling only to an exclusive boutique in Los Angeles, but his work hardly went unnoticed. After a few years of cult success, Owens left the West Coast for Paris to further develop his dark aesthetic. Aside from his signature collection, Owens also produces the casual diffusion line Lilies, a minimalist range of furniture and DRKSHDW, a cutting-edge denim line. Hallmarks of the designer’s work include abstract prints, draping and asymmetry. Vince Camuto is known for its on-trend clothing and accessories that always captures the hottest looks in fashion. This collection of dresses from the mega-brand is no different. Here an array of styles are featured in ultra-femme silhouettes and bright and bold hues. Whether you’re looking for pieces to wear to the office or an upcoming party, Vince Camuto has you covered. When it comes to jewelry, sometimes all you need to make a statement is beautiful design. Argento Vivo offers just that with a subtle collection of modern must-haves. Delicately detailed drop earrings. Classic hammered cuffs. Striking pendant necklaces and rings. These elegant and versatile sterling silver baubles will become jewelry box favorites. One of the best ways to showcase your individual style is by wearing a piece of unique jewelry. This collection makes it easy with an array of zodiac symbols and letters. Eye-catching ID bracelets with polished finishes put your initials on bold display. Or, keep things sweet and simple with an understated zodiac pendant on a delicate chain. Nab one for yourself and give one as a gift to help someone else personalize their look. Give your make-up routine a mid-winter makeover with this collection from 29 Cosmetics. Named after the picturesque road—Highway 29—that runs along California’s Napa Valley, the line offers beauty products you can feel good about. Moisturizing lipsticks in pretty reds and vibrant pinks. Smoothing eye shadow palettes that make smoky eyes a cinch. Blushes and bronzers to create a healthy glow. You’ll looks and feel renewed no matter the weather.